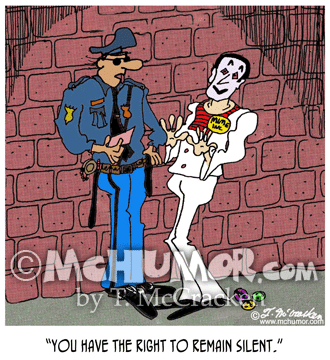 Police Cartoon 1364: A police officer saying to a mime, "You have the right to remain silent." 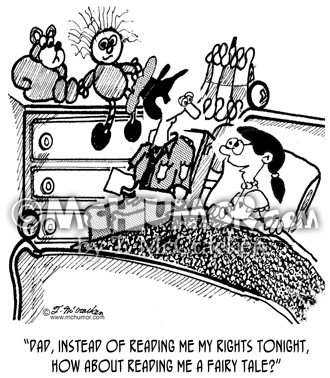 Police Cartoon 2017: Kid in bed saying to a cop sitting by her, "Dad, instead of reading me my rights tonight, how about reading me a fairy tale?" 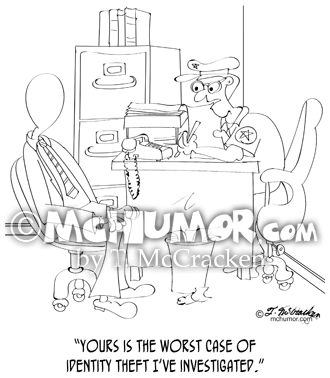 Police Cartoon 7986: "Good Cop, Bad Cop." 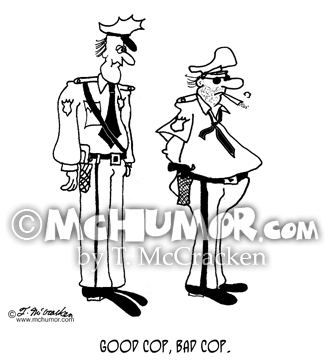 A fit cop stands next to a fat one over weight and smoking. 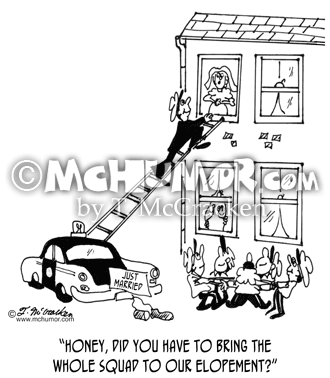 Police Cartoon 5798: An eloping bride says to her policeman groom, "Honey, did you have to bring the whole squad to our elopement?" Officers hold a net under the ladder. 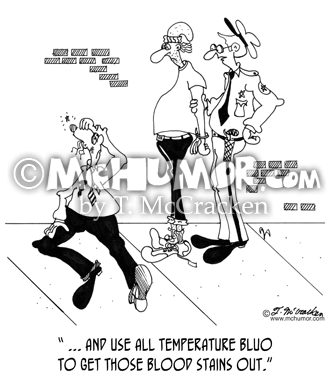 Police Cartoon 5126: A police officer arresting a mugger says to the bleeding victim, " ... and use All Temperature Bluo to get those blood stains out." 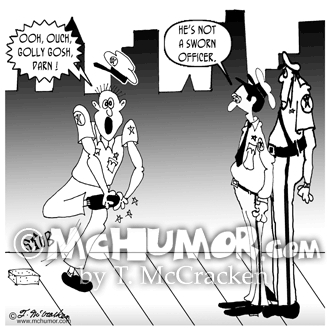 Police Cartoon 7476: Of a policeman who's stubbed his toe and is saying, "Ooh, ouch, golly gosh, darn," another says, "He's not a sworn officer." 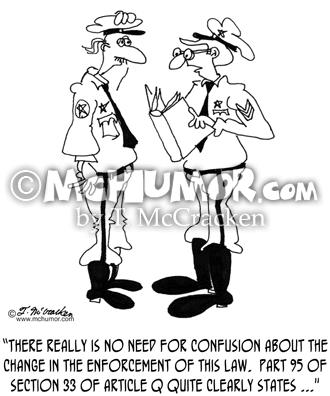 Police Cartoon 5842: A sergeant says to a confused cop, "There really is no need for confusion about the change in the enforcement of this law. 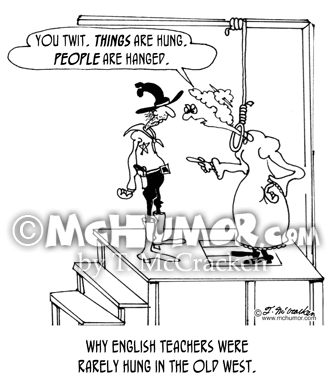 Part 95 of section 33 of article Q in the manual quite clearly states ..."
English Cartoon 6598: "Why English teachers were rarely hung in the old west." 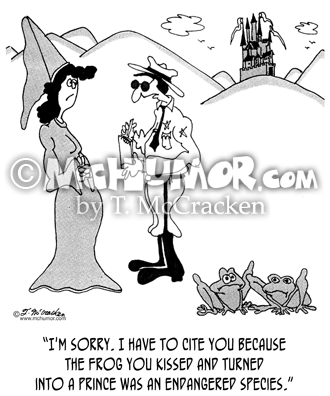 A woman being led to the gallows argues with the hangman: "You twit, THINGS are hung, PEOPLE are hanged."